In my Tips column I’ve previously written about my struggles with allergies and some of the ways I cope with them. The last time I made a significant project out of cedar, a hope chest for our eldest granddaughter, I developed a cough that lingered for months. Repeatedly, I went to my ear-nose-throat doctor, trying different medications. I don’t think any of them made a difference; I believe it finally just went away. We never identified a cause. 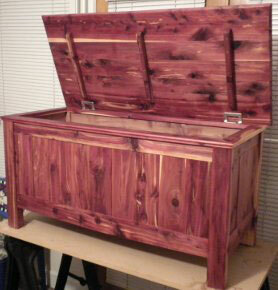 Truly a labor of love, a hope chest for our eldest granddaughter. At that time I had an overhead room filter, and power tools connected to individual shop vacuums, but no other form of dust management. Some of the time I wore a surgical mask when I sanded, but I was quite lax about the dangers of dust. After the cough, however, I changed my ways. I broke down and purchased a Oneida cyclone capable of collecting several machines at once via whole-shop ducting. 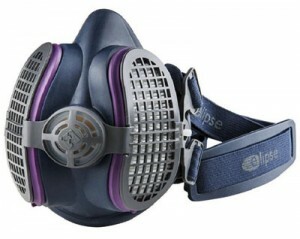 I bought the Elipse P100 Dust Mask and I wear it most of the time and all of the time that I’m creating fine dust. The Elipse Dust mask is highly rated and reasonably priced. Recently I’ve been thinking of my best friend from my Air Force days, Ken Shellberg. A native Ohioan, Ken taught microwave communications electronics with me at Keesler Air Force Base in the 70s. Music was hugely important to both of us and we took full advantage of the deep discounts afforded us in military stores, stocking up on electronics and speakers. After our service, Ken went back to Ohio and began building his own speakers, mostly from prefinished, veneered particle board. Before long he had developed allergies to ingredients in the particle board and had to quit woodworking altogether. Lately, I’ve been working on a round cedar picnic table with curved benches for our two youngest grandchildren. And, the cough is back. Well, of course, there is no way to know if it’s the same cough, because we never identified the cause for the previous cough, but it’s suspicious. I couldn’t help wondering whether, like Ken, I might have to give up woodworking. Giving up cedar would be bad enough, as it’s one of my favorite woods. Of course, if I sold all of my woodworking equipment, I could afford to get the transom fixed on my bass boat. I also had a very long lasting cough after working with cedar wood. It was many years ago, when I was young and reckless! I’m always sure to wear protection nowadays and that seems to have helped. I’ve been afflicted by a condition similar to what you describe. I was diagnosed with Vocal Cord Dysfunction (VCD) after trying many different medicines/treatments. Mine is usually triggered by a cold or sinus infection. I’m thinking that anything that would inflame/irritate the vocal cord could trigger it as well. Perhaps it’s worth looking into. I don’t believe there’s a “cure” but the breathing exercises seem to expedite the cough. I do woodturning outside and wear either a P100 respirator or a P.A.P.R. Even outdoors, I still have to be careful during and after sanding. I seem to be most sensitive to Juniper, but I suspect that dust from many species can trigger allergic responses with prolonged exposure. I am a chemist by training and have all kinds of nasty things I have needed to avoid breathing. That has made me concerned about wood dust (and other dusty things since the 1980s). So far, I have been working exclusively with hand tools to avoid the fine dust. I even have a particle size count meter I use to get a feel for how much fine dust is generated (minimal for most things). I very rarely use any sand paper. I am thinking of getting a few power tools (joiner, planar, bandsaw) as I hate S4Sing wood by hand (I can do it just slow). Along with that purchase would need to be dust mask and all of the other things you have done. So far the cost has kept me away from implementation. The lumber yard where I live will happily S4S the wood for about $75 for 100 board feet. As such, so far I have been having them do that instead of the buying the equipment. Remembering Michael Gilmartin Lie-Nielsen Summer Open House – This Friday and Saturday!